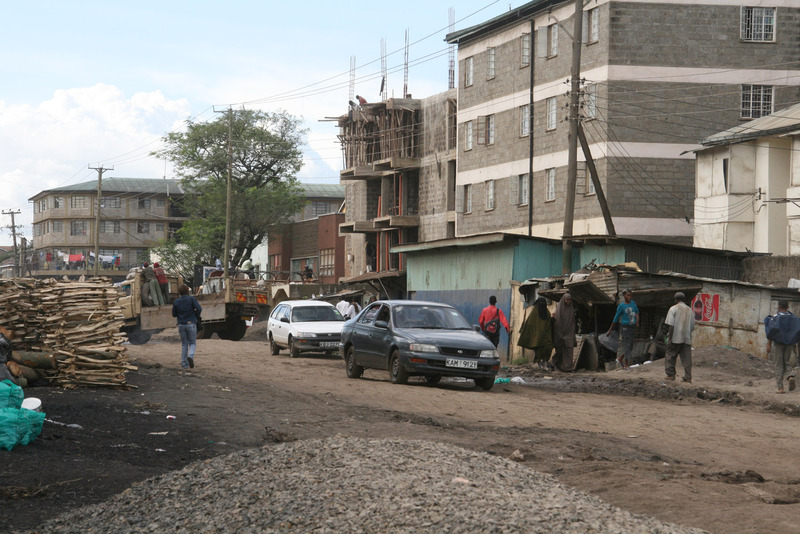 Asha Abdul*, a single mother of five, can put up with the rubbish and appalling roads connecting the modern shopping malls in Eastleigh, a suburb east of Nairobi's central business district, as long as she is not questioned about her status in Kenya. "Sisi ni Waria [Swahili for 'we are Somalis']; we don't like attracting attention to ourselves by complaining about poor services," Abdul said on 7 April as she fried samosas for sale outside her house in Eastleigh. She had just paid Ksh1,500 (US$20), required of every tenant on her street, to pay some young men to deliver two lorry loads of stones to cover the dilapidated road outside their homes. "If we don't pay these young men to bring the stones, then the muddy water flows into our homes, especially when there is heavy rain," Abdul said. "With the stones in place, then we can cross the road and go about our business while the children can get to school." Abdul fled the Somali capital, Mogadishu, two years ago to escape fighting between government troops and Islamist insurgents who are opposed to Somalia's Transitional Federal Government. Since her arrival in Eastleigh, she has not registered with either the Kenyan government or the UN Refugee Agency, UNHCR. Her husband abandoned her and the children and she started making samosas and bhajias to survive. "Many residents of Eastleigh prefer to just pay for these things - water, road repair - to avoid the hassle, instead of complaining to the city council," Abdul said. Abdul is one of the estimated 46,000-plus unregistered refugees living in Nairobi, who, due to their unclear legal status, continue to suffer police harassment, lack of protection, violation of their human rights and discrimination. Choice Ufuoma Okoro, advocacy and outreach officer for the UN Office for the Coordination of Humanitarian Affairs (OCHA-Kenya), told IRIN the issue of urban refugees was under-addressed within the "overlooked" issue of urban vulnerability. "Urban refugees live largely without material assistance or legal protection, leaving them vulnerable to police arrest at any time, and face high levels of xenophobia from the local population," Okoro said. "The challenges faced by urban refugees in Kenya falls within the broader issue of the 'hidden' urban humanitarian challenges. Ahmed Hirsi, a medical specialist in Eastleigh's Second Avenue, said poor roads in the suburb had undermined public health, with many people - young and old alike - complaining of constant coughs, especially during the dry season. "The health problems caused by the dusty conditions are many; some have eye problems because of the dust... we noticed these [conditions] mostly from dust and poor sanitation," Hirsi said. "As most of the people here are refugees, many cannot afford to seek specialized treatment for some of these conditions." Halima Yasin, a greengrocer on First Avenue, said: "We live like animals; when it is dry, the dust is just too much, it is all over the fruits and vegetables. When it is rainy, some customers even shy away because of the smelly mud..."
Jamilo Abdi, a milk vendor on Seventh Street, said: "You can’t imagine how we survive; poor roads are our main concern because customers at times don't want to buy from us, they say we are selling a virus. Somalis can be boastful yet we depend on milk-vending to get our daily bread. Since the government collects tax from us, it should help us." Both Somali refugees and Kenyan Somalis are involved in milk-vending on Seventh Avenue. Omar Shamun and his wife, Khadija Mohammed, who ran a clothing and shoe shop in Eastleigh, said the poor infrastructure had not only affected their business but also limited access to schools and health centres. "It is pure agony whenever you go into Pumwani Road nearby, the road is almost impassable; we have to hire taxies to take our children to school because of the mud," Mohamed said. During the dry season, she said, dust coats everything. "If a customer drops an item they are buying, they can easily reject it because it becomes really dirty, but it is worse now that it is rainy most of the time, you dare not drop anything." Shamun, who has acquired American papers, said he came into the country recently to arrange to take all his family to the US. "Already four of our children are in the US; I am here to make arrangements for my wife and six other children to travel with me to the US. Life here is unbearable, look at all the filth, there are no good roads and going to school is a challenge for our children," Shamun said. In a recent joint report, the Humanitarian Policy Group (HPG), International Rescue Committee (IRC) and Refugee Consortium of Kenya (RCK), said the right of refugees to move freely within the country and reside in urban areas was currently unclear. In 2006, the Kenyan government passed a Refugee Act setting out the legal and institutional framework for managing refugee affairs. However, Pavanello said, "while the act was largely welcomed by civil society and represents a step in the right direction, it has been undermined by a lack of institutional capacity and the absence of a clear national policy outlining the necessary steps for its implementation".